We are in the middle of the big move here. The camera cable is somewhere around here, but I'm not sure where at the moment. When I find it, I'll post some pictures. The new office is just perfect. Sometime in the very near future, I'll be able to work so much more efficiently. Not having the business scattered throughout the house is a huge gift. That alone is worth all the work of moving. The setting is idyllic. From the window in the office I can see farms, silos, and lush greenery. That view used to be...a brick building. Yesterday I looked out to see the flock of "wild" turkeys following the farm equipment up into the fields with the dog in hot pursuit. The corn is thigh high, the melons are blooming, and my herbs are happy as can be. The recent flooding rains have turned the garden into a jungle, so there's a lot of work waiting out there. I brought in a bloom from the passion flower vine and put it in a saucer on coffee table. Those things smell fabulous! The Jerusalem artichokes are really taking off, and soon will be waving cheery little sunflowers towards the window. Its still sinking in. The saying "bloom where you're planted" comes to mind - except that at this moment, I'm realizing that I've been planted in the most beautiful patch around. So... until I find the cable, that's it for now. Yesterday in the afternoon I wandered around looking at all the flowers that are knocking themselves out being gorgeous. 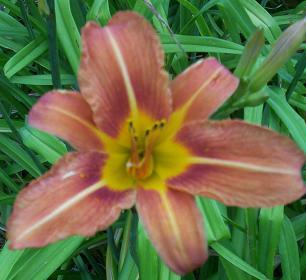 As I mentioned earlier, there are huge stands of daylilies out and the buds are at the perfect ripeness for eating. 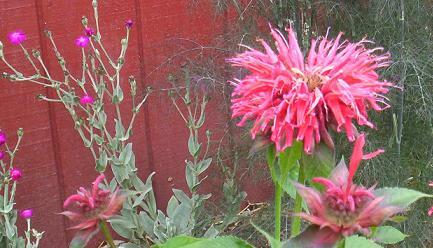 The bright red poppies were a stunning splash of color, and the bee balm with it's shaggy head is one of my favorites. 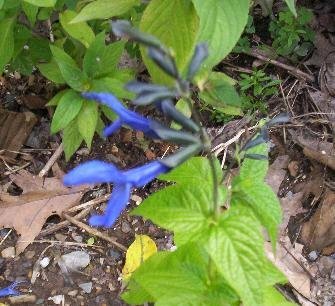 The blue salvia is called "hummingbird sage" and the blue is electric. The stems are nearly black. It is a small plant (at least now) and an annual, but it is truly breathtaking. 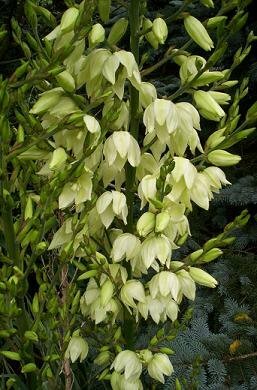 The yucca stalk is actually about 7 feet tall, and the cream colored flowers are beautiful. This picture is taken of a middle section of the stalk, since it waved far above my head. 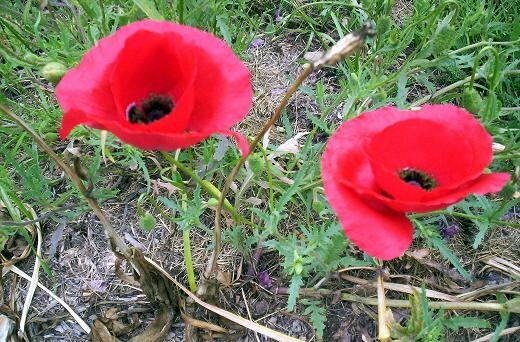 There were other flowers just popping open, too. My brother in law spent a few days a month or two ago spreading wild flower seeds which he then covered with hay. We don't know exactly what to expect there, although there have been a few opening here and there. One was a tiny yellow poppy, whose color was so intense that it washed out the green behind it. Just gives me more pictures to take on another day! The move to the new home/office starts in earnest today. The flower and veggie gardens have already been planted - for this year, although more will go in during the fall, and there is a large sack of saffron bulbs waiting for me to find a space where the rabbits won't get them. It is good to have the ability to plant at will again. My fingernails have dirt under them again and there is a greenish tinge to my fingertips. Sigh.... that makes me so happy! Everything is just a little bit early here. 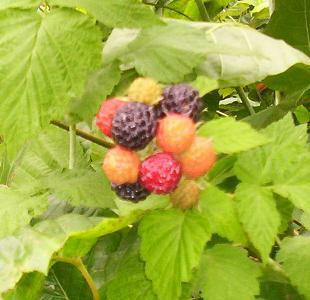 I've been picking berries like crazy, because they are two weeks early and took me by surprise. Usually by now I've got the stands all staked out and am keeping an eye on them. This year, they exploded without warning. They are plump, juicy, and BIG! 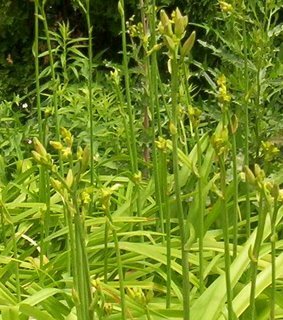 The daylily buds are in the midst of their own fleeting season, as well. If you've never had the pleasure of tasting a daylily bud, don't wait another year! My favorites are the small ones with little to no orange - just green. They taste a lot like beans to me, but "more". 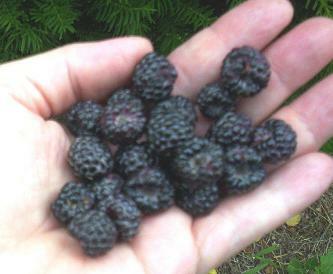 I like to add them to salads, munch them raw when I find them in the woods, or throw them into a stir fry. I've read that some people can get a bit of an upset stomach from them... I thi nk it was Peter Gail who mentioned that possibility in his book about daylilies. It has never been an issue for me, but bears mentioning. All parts of the daylily plant are edible, and the flowers are dried and used in some Asian dishes. 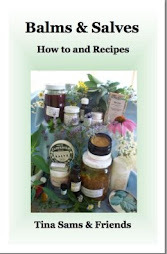 Peter was kind enough to send several dandelion recipes for the Wild Foods for Every Table book. We've been getting lots of reviews for the book since it hit the mail on this past Monday. So far, it has all been good and they are flying out of here. July/August '06 issue is out! 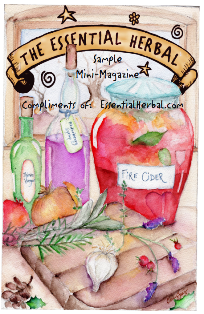 The latest issue of The Essential Herbal is in the mail. 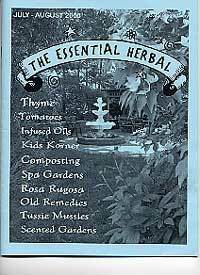 Full of all sorts of recipes - tomatoes, roses, thyme, lavender, and lemon in particular, and lots of info on gardening and what to do with that garden bounty. 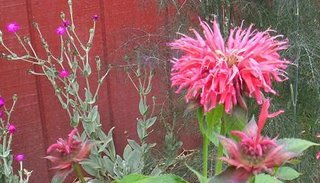 Karen Hegre of Black Hills Herbs & Aromatherapy debuted a new column to help parents share their love of gardening and herbs with their kids. That should be a lot of fun. Almost as soon as the magazine was in the mail, I took a few days off to visit the beach and came back just in time to pick up the finished Wild Foods for Every Table and get the pre-ordered copies into the mail today as promised. There are still a few strays that need to go into the mail, and then we'll get serious about the move. It is getting hard to accomplish anything - with half of the office here and half there. 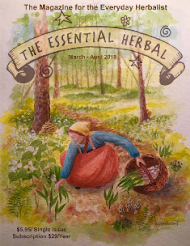 What's happening at The Essential Herbal? We're moving! 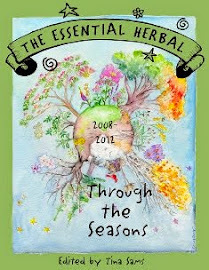 That's what's happening at The Essential Herbal! Yesterday I was hauling a load of stuff to the new place, and stepped out on the back deck with the camera. There was a storm brewing, and it was the first time I noticed that we will be on top of the world. The clouds were swirling in many different colors - pink, blue, purple, and a patch of aqua! It was as if I was standing in the middle of the clouds and could touch them... like flying through them in a plane. Anyhow.. scary and beautiful at the same time. The first picture shows the patch of dirt that has been tilled and now has beans, brocolli, leeks, squash, many annual culinary herbs, and a row of lavender. There are a couple eggplants to go in, and some banana peppers. This shot is looking straight out the back of the house. The silos are the next farm over, and then the farms on the horizon are several miles away. We do have some neighbors close on the sides, but the view is so stunning. Looks like the deck will be seeing lots of me. My office window looks out over this same vista. 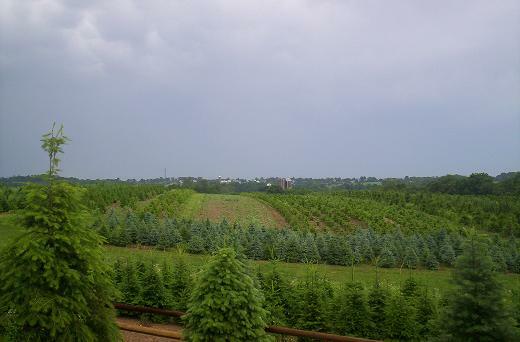 The trees are various conifers that my sister's husband grows for landscapers and Christmas trees. 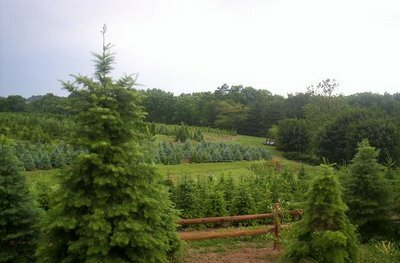 They live down the hill to the right - in the hollow (their farm is called Frog Hollow Evergreen Farm). 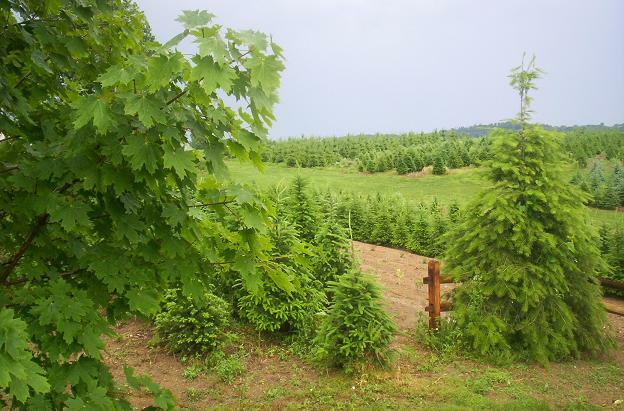 It isn't visible because of the lush growth, but Maryanne's soap and glass studio is right down there. We haven't decided exactly where the still will be set up, but either way, we have space to do just about anything. The fence in the back has also been planted with lots of heirloom tomatoes, heirloom peppers, passion flower vine, perennial herbs and watermelon vines. I am having an absolute blast... and once I get the next mailing out, moving will get serious. It was a lot of fun, and we saw lots of old friends... made some new ones, too! 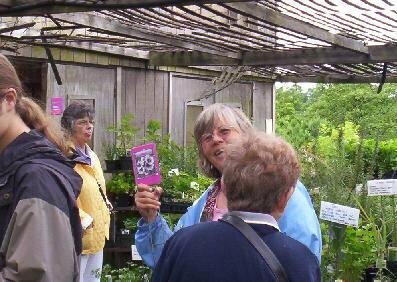 First let me introduce you to Barb Steele (that's her waving the flyer), who along with husband Roger owns and runs Alloway Creek. We've known the Steeles for about 15 years, and they are always fun to be around. Our booth was inside a large 20' X 30' tent that we shared with a woman who hand dyed silk scarves, a woman from Heifer International, an artist, and the "gang" from East Berlin, PA who are raffling off a hand-made quilt that will be awarded at their Colonial Day Festival Sept. 9th. If I find their information, I'll add it later. As we got to know our neighbors we all joked around and had a good time. Very few of the people we shared the tent with managed to leave without a piece of my sister's hand made torchwork jewelry. Lots of soap went, some of those felted soap balls I may have mentioned, and even some of the road apples! I got to meet in person some of the people who have been subscribers for a long time. 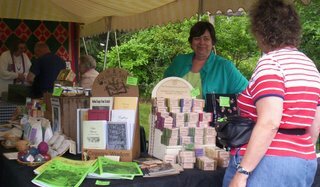 That's Maryanne behind our booth. 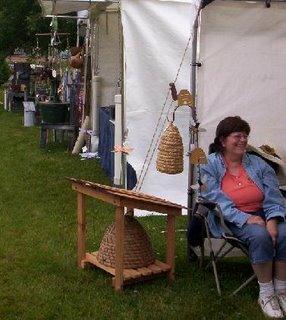 There were probably about 25 or 30 vendors of all sorts at the faire. 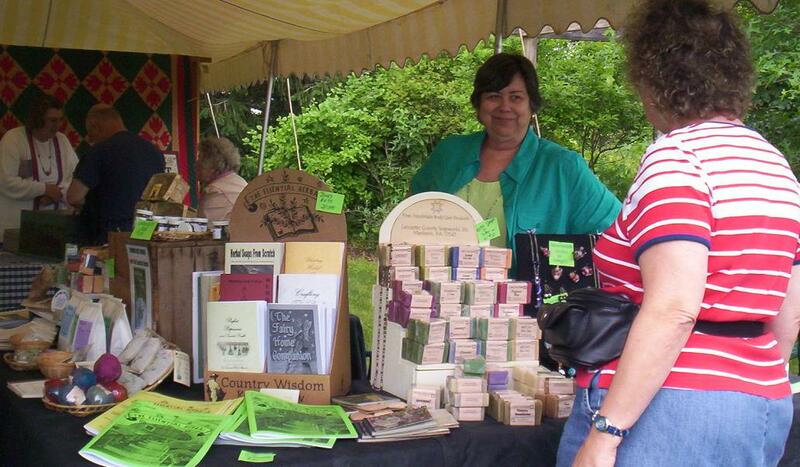 Barb Will (orange shirt) of Sugar Grove Herbs writes for us sometimes, and is fun to vend near. We kept a conversation going from across the garden. There was a guy making wind chimes using silverware, a spinner and weaver, handmade sweaters, a couple potters, antiques, etc, etc. A neat, eclectic mix. 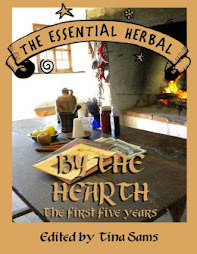 The food was from a caterer called Herbal Faire, and was delicious - a rare thing since outdoor events generally feature warm foods that should be cold, and cold foods that should be hot - none of which tastes very good. 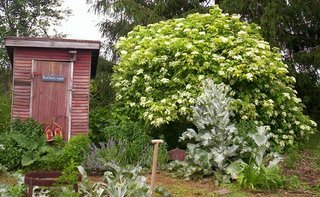 Here is just one photo of the magnificent gardens that Barb and her crew put together. It really is a stunning herb farm. She did an equally stunning job putting together her faire.